Hello everyone! I’m here today with the Less is More Week 179 Challenge. I haven’t played with them in awhile so I decided to join them with their Earth Tone Color Challenge. So, you guessed it, it’s the tenth hour and I have to hurry to submit my card. So, no long talking today. I just received my new order from Simon Says Stamp Kelly Purkey’s sale. I ordered the feathers die and thought it would work well with this challenge. I die cut the four feathers from Lawn Fawn’s Into the Woods pattern paper. Then I attached them to each other using a Stampin’ Up! glue dots. Then I added Stampin’ Up! linen thread to a retired Stampin’ Up! naturals button, tied a bow and adhered it to the top of my feathers. I stamped my sentiment giving thanks from Simon Says Stamp Giving Thanks Stamp Set with Colorbox Chestnut Roan chalk inkpad. Nice, clean and simple card with a lot of white space. « You Make My Heart GLOW!! Hey Deepti!! Thank you so much. The button and the feathers just remind me of nature. 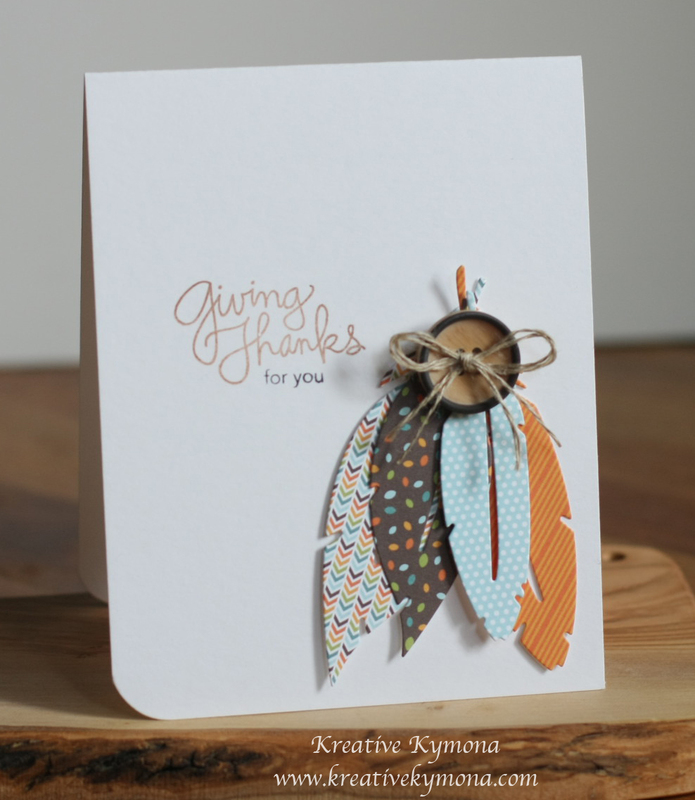 Loving this feathery card, beautifully put together and so effective !! Hey Sid!! Thank you so much for your kind words. I was really trying to keep it clean and simple. I was going to add some sequins but decided against it. I like just like this. Hey Sarah! Thank you so much for your kind words. As I was creating this card I know I wanted to keep it very clean and simple. I was tempted to add some brown sequins but decided against it. I’m glad I did. Hey Karen thank you for your kind words. These dies are amazing, I can’t wait to use them again. Yes, you need to get them. Have a great weekend too! so gorgeous!! love, love, love the feathers!! Hey Rosemary!! Thank you so much for stopping by and leaving such a great kind comment. Hey Jen! Thank you so much for your wonderful comment. Thanks for having me. Hey Anne! Thank you so much for leaving such a wonderful comment. Thank you for having me. This was a great challenge. Thanks again. I really like this one too. This card is simply lovely and totally proves that less is more!! I love the different pattern papers you picked to die cut your feathers, they match so well and accentuate each other!! Way to go, another awesomely cool card!! Don’t know how I missed this last week… it’s simply fabulous! Hey Chrissie! Thank you for your wonderful comment. I’m so glad you got a chance to see my card. Thanks for having me. I love these pens and use that you’ve done!